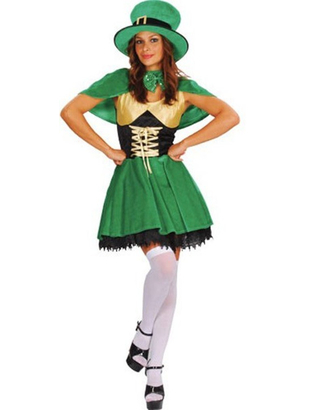 Lucky Ladies Leprechaun costume is an Irish dress made with a velvet material. The top of the dress is black and gold corset style with criss cross lace up the front and straps approx. 5cm wide. The skirt is an Irish green colour. Included are cape, bow tie and hat. Add stockings to complete this look. 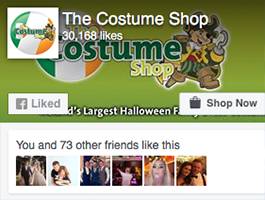 Please note this is a small fitting costume. loved this dress .. fits perfectly a Large is size 16 so it was exactly right. I ordered this yesterday at lunch time and i got it this morning. It is fab i am delighted with it. It is exactly the same as it looks in the photo. The size was just right and the quality is great. Thank you so much for the fast service. I ordered this yesterday at 2pm it was delivered this morning at 9am. It is fab i am delighted with it, the size is perfect and the quality is great. Thank you i am extremely happy with it.